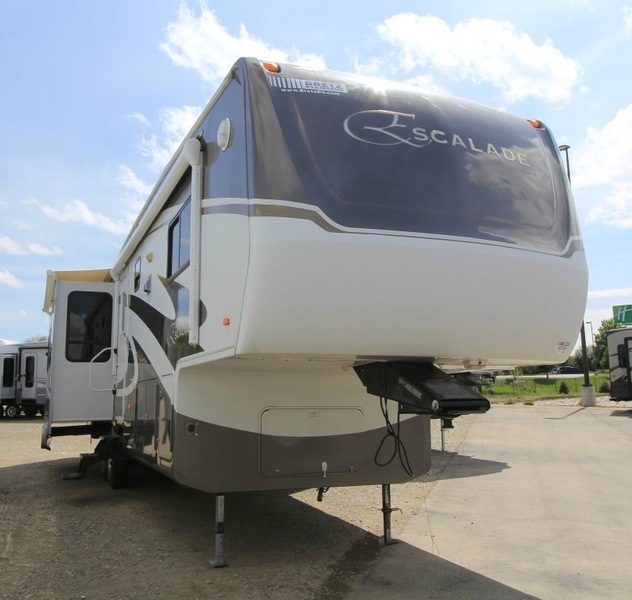 2007 KZ Escalade 36SKB, Triple Slide, Rear Living Area w/2 Recliners, End Table, Overhead Cabinets, Hide-A-Bed Sofa & Table & Chairs Slideout, Stereo/Desk/TV/Refrigerator/3 Burner Range & Double Kitchen Sink Slideout, Pantry, Coat Closet, Step Up To Bed & Bath, Angle Shower, Lav., Stool Room, Wash/Dryer Cabinet, Queen Bed w/Nightstand Slideout, Wardrobe w/Sliding Doors, Closet, TV, Awning & Much More. 2007 K-Z Manufacturing Escalade 36KSB, Excellent condition - like new; beautiful cherry cabinets and trim, kitchen island, fireplace/heater, 32" LED TV plus TV in bedroom, surround sound theater, double 4 door refrigerator with water dispenser, solar system, dual air conditioners, leather recliners and sofa, expanding table with 4 chairs, central vacuum and floor sweep, tons of cabinets and underneath storage, 5th airborne. 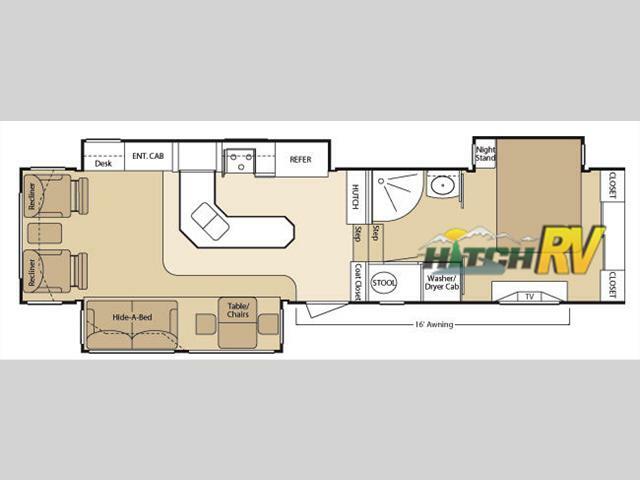 This fifth wheel has it all! $34,500.00. Excellent full time home. 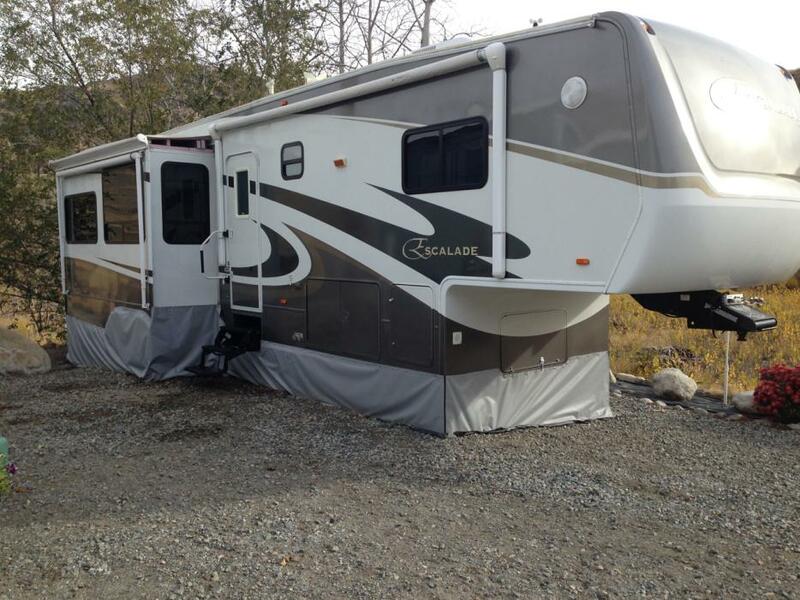 We have lived in this rig for 9 years and it has been our home, so it is well maintained. The only issues we have had are a blow-0ut on one tire that caused some minor damage to fender area and a water leak under the sink which went un-noticed so I had to repair some damaged wood. Roof was replaced in 2009 by KZ and is in good shape.Now for the particulars, I removed the partial carpeting in the living area and replaced with highest quality vinyl planks, upgraded brakes to hydraulic disc and greasable shackles at the Mor-Ryde factory and upgraded tires to 17.5 "H" rated goodyear 2 years ago in addition I have 4 wheel tire monitoring system, replaced problematic Norcold refrigerator with residential 15 cu.ft. Fridgidair, (since I have built in Onan propane generator) I have no problem with traveling. The rig had a new paint job (factory warrantied), so the exterior is like new. Replaced 2 awning toppers this year and one topper a few years ago. 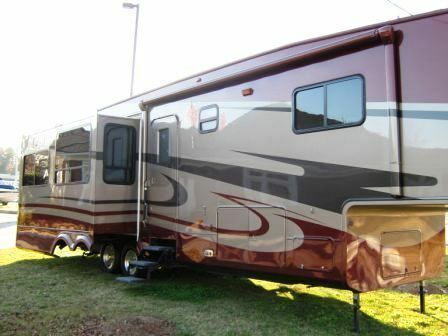 In addition to standard power awning, there is an additional full awning on the living room slide. It has the air-ryde hitch and independent front electric leveling jacks. It has w/d hookups, but since we needed closet space we have no washer dryer. All appliances and a/c are original but everything is in great shape. It has the island counter upgrade for more space. The living room TV has been upgraded to digital but the bedroom TV is original 13" analog. I removed the VCR because we didn't use it and the TV/DVR/Aux control box went out but I didn't replace it because we use Dish. If you wish to use the local antennae, you would have to add a powered outlet (12 volt) . I removed the heavy sleeper sofa, (non use) and now have just 2 recliners in addition to standard table and chairs. Ceiling fan was upgraded a few years ago. There is the standard 15 K ducted A/C and a non ducted 13.5K bedroom A/C if needed for quick cool down. I have added some LED lights and installed lights in a lot of the cabinets. 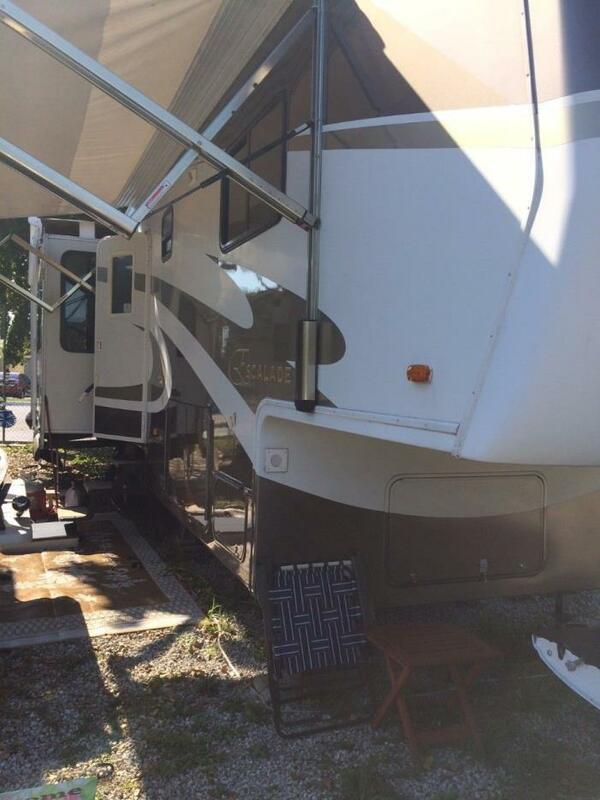 It has day/night shades, all in good shape and working and double pane windows through out rig. Power converter has been upgraded to Progressive Dynamics and 2 batteries replaced in 2014.Yes there are minor usage wear and tear, but nothing major. Propane bottles (2-40lb) have been certified and are good to go. We are looking to get off the road and purchase a home and will probably downsize to a smaller rig.Rig is presently in Miami Gardens, Fl. but we could be anywhere in the next month. The rig weighs 16,800 approximately 3760 lb hitch weight and 13,000 lb trailer axle weight, but that is with all our stuff (and lots of my tools) so you would want a tow rig capable to carry this rig. Price is firm. I don't have pictures at this time, but I would be happy to email pictures. Rig is titled in Texas and I would pay off loan and give clear title, which may take a day or two. 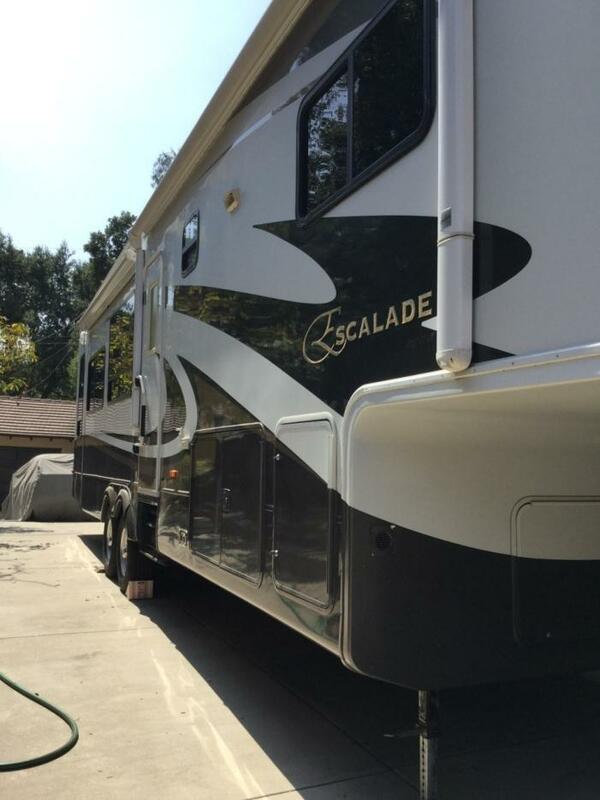 2008 KZ Escalade 36SKB 38' 5th Wheel, with all the bells and whistles.